Fruta Planta USA is the original Fruit & Plant weight loss formula, produced exclusively in the United States in an FDA compliant facility. All ingredients are carefully selected and tested under GMP Good Manufacturing Practices. 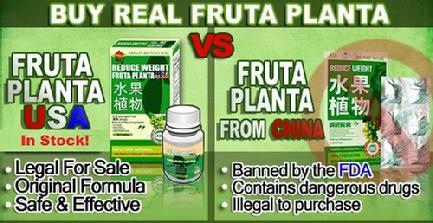 Fruta Planta USA does NOT contain Sibutramine an illegal drug found in dangerous Chinese versions. 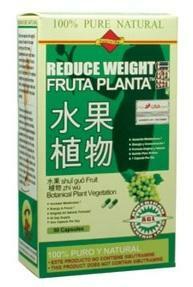 Fruta Planta USA lists all product ingredients in the supplement facts panel unlike cheap Chinese versions. Fruta Planta USA Original All Natural Formula is a dietary supplement that incorporates traditional Chinese Medicine laws of nature providing the benefits of fruits, plants, and herbs. This 3000 year tradition combined with modern analytical methods, strict quality control, good manufacturing practices and careful ingredient testing make Fruta Planta USA your choice for excellent nutritional results. Suggested Use: Take one capsule with eight ounces of water 45 minutes prior to your first meal. Experienced users may take a second capsule after 6 hours. Do not exceed 2 capsules in a 24 hour period. For optimal weight loss results combine with a reduced calorie diet and an increased level of physical activity. Caffeine Anhydrous, 4-Methylhexan-2-Amine HCL (Geranium extract leaves and stem), Corynanthe Extract (Pausinystalia Yohimbe Bark), Kola Nut (seed) 3%Caffeine group Alkaloids, Green Tea (leaves), 3,7-Dihydro-3, 7-Dimethyl-1H-Purine-2, 6-Dione, Yerba Mate (leaves), White Willow Bark, L-Arginine Ethyl Ester DiHCL, Choline Bitartrate, Beta Alanine, DMAE, L-Alanine, Capsicum (Fruit), Sodium Pyruvate, Guanidino Propionic Acid, Hordenine, Bitter Melon Fruit (Momordica Charantia), Mangosteen, benefit Fruit (Garcinia Cambogia), Kiwi Fruit (Actinidia Chinensis L.), Lemon Fruit (Citrus Limonum), Papaya Fruit (Carica Papaya), Spirulina (spirulina Platensis). Warning: Not recommended for use by minors. Do not use if you are pregnant or nursing. Consult a physician or licensed qualified health care professional before using this product if you have, are at risk for, or have a family history of Stroke, Heart Disease, Thyroid Disease, Liver Disease, Kidney Disease, Ulcer, Diabetes, High Blood Pressure, Caffeine Sensitivity, Recurrent Headaches, Anxiety, Depression or Other Psychiatric Condition, Glaucoma, Difficulty Urinating, Prostate Enlargement, Seizure Disorder, or if you are using any other dietary supplement, or a Monoamine Oxidase Inhibitor (MAOI) Prescription Drug or Over-The-Counter Drug containing Ephedrine or Pseudoephedrine (Found in some Allergy, Asthma, and Cough/Cold products). Do Not Exceed recommended serving. Individuals who exceed the recommended serving or consume caffeine with this product may experience serious adverse health effects. © Copyright 2012 Healthbay Natural Foods. All rights reserved.